The Sony Ericsson MBW-100 Bluetooth Watch is probably a must have gadget for those of you already possessing one of newest Sony Ericsson mobile phones. Owners of other mobile phone brands may of course crave for this watch as well, but it is not compatible with other brands than Sony Ericsson. The watch itself is made in partnership with Fossil. Fossil has probably made the mechanical part and Sony Ericsson the Bluetooth component. The watch is rather heavy (187,5 g), massive, and has a fairly masculine style with its polished steel housing. Sony Ericsson MBW-100 is available in a black limited edition and a silver variant. All photos in this review are of the silver variant. The obviously things first: MBW-100 is a analogue watch where the time is set by dragging out the quite large crown and turning it round just like you do with any other analogue watch. 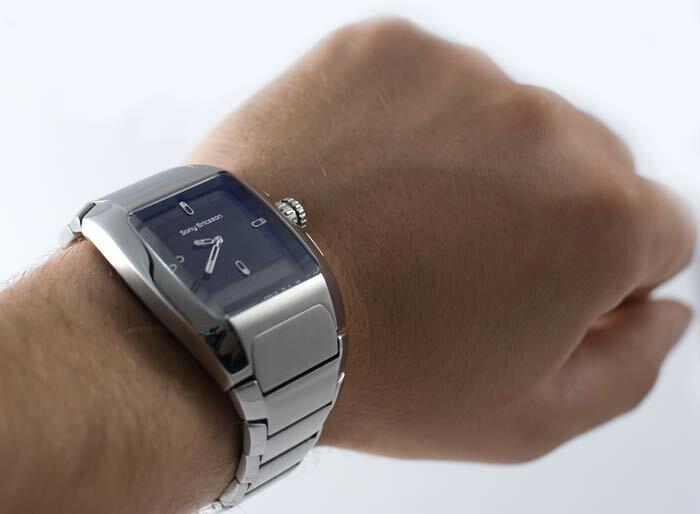 Now to the part that describes the unique features for this watch; he communication with your mobile phone. Two buttons positioned above and below the crown wheel are used to set up and control the communication settings. The mobile phone and the MBW-100 need to be paired before they start communicating. The pairing process is quite simple. Make the phone searchable by other Bluetooth devices and press one of the watch keys to search for available phones. When a phone is found it will ask for the standard 0000 paring code. The phone and MBW-100 is now linked together and the watch will search for this phone whenever it loses the connection for more than 30 seconds. That is actually one of the nice features of the watch. You can set it up to notify you when the phone gets out of range. It will do so by blinking an icon in the status area and vibrate at the same time. So if you tend to forget your phone, this watch will help you never do that any more. Notify when receiving a message by displaying an envelope icon in the status field and vibrate. Notify of incoming calls. Name of the caller will be displayed in the watch status field if the caller has an entry in the phone contact list. The caller name is not stored in the watch, but is transferred from the phone during the incoming call. Incoming calls can be muted or rejected by pressing one of the watch keys. If you want to talk to the caller, you will have to pick up the phone of course. Notify when connection to phone is lost. Again, display an icon and vibrate. The three notification alarms can be switched on and off independently of each other. and icon for start pairing. The MBW-100 can only be connected to one phone at a time. The pairing process needs to be repeated if another phone is going to be connected. Sony Ericsson MBW-100 can also operate as a remote and control the phone media player. It is done by pressing the watch crown. Depending on the phone model and therefore installed phone applications, it is possible to start, pause (not stop) and forward to next track on the music player and start and stop the FM radio. It is the last used phone application that will be started or paused. The manual claims that 2 meter is the out of distance range if the watch has a direct visual view to the phone. This distance will be shortened if solid objects get in the way. I have experienced that the connection was lost when the phone was in my right hand pocket and the watch was on the left hand. I have also been able to controll the media player from up to 10 meters of free sight. 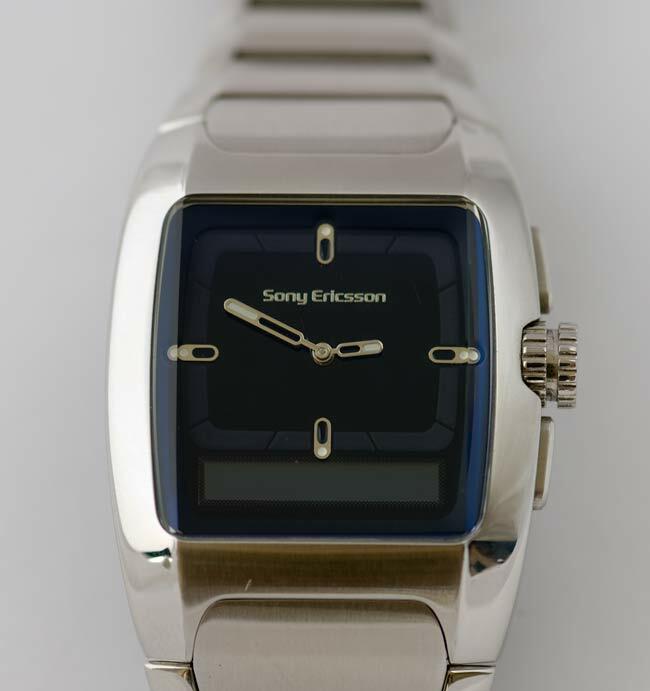 Sony Ericsson MBW-100 Bluetooth Watch displays three levels of battery status. Fully charged, 2/3 and 1/3. One of the things I was curious about when I first got it was how long the battery would last. The first charging lasted one week, the second lasted two weeks and now on the forth charge I have been using it for almost 3 weeks without recharging. You will probably want to start recharging when battery status is on one third because Bluetooth will turn itself off when battery level is below this level. MBW-100 is a very small device with limited room for battery, and in my example it had Bluetooth turned on for 21 days (504 hours). I think that is quite impressive. The MBW-100 uses connects to the regular Sony Ericsson Two Port Standard Charger CST-75 via the included extension cable. It has a special clamp wich is put round the clock and the other into the charger output. CST-75 is the carger following the latest Sony Ericsson handsets wich means that you do not need to clutter your desktop with one more of those chargers. My guess is that the current design will attract mostly male buyers. It's a gadget made just for male. MBW-100 is a cool watch but I miss some basic features I think Sony Ericsson should have implemented. What about a stopwatch and timer for example? These are features I had on my first red LCD display wristwatch back in the eighties. Yes, your phone most likely has these features but it is often easier to touch your left wrist for such tasks. Time and date can not be adjusted on the watch directly. MBW-100 fetches this data from the currently paired mobile phone during initial setup. If the Bluetooth pairing is reset, the watch will not display date or time until a new pairing is set up. It should be possible to adjust the time and date without a paired phone nearby. To some, a watch is a piece of jewellery and the masculine look of the MBW-100 is soon to be replaced be the newly announced Sony Ericsson MBW-150 Executive Edition, MBW-150 Music Edition and MBW-150 Classic Edition. I use my MBW-100 every day and think it looks good. You might prefer one of the other more classy models. Sony Ericsson MBW-100 is currently available for aouround 260 Euro, but expect the price to drop as soon as the three new models are for sale.